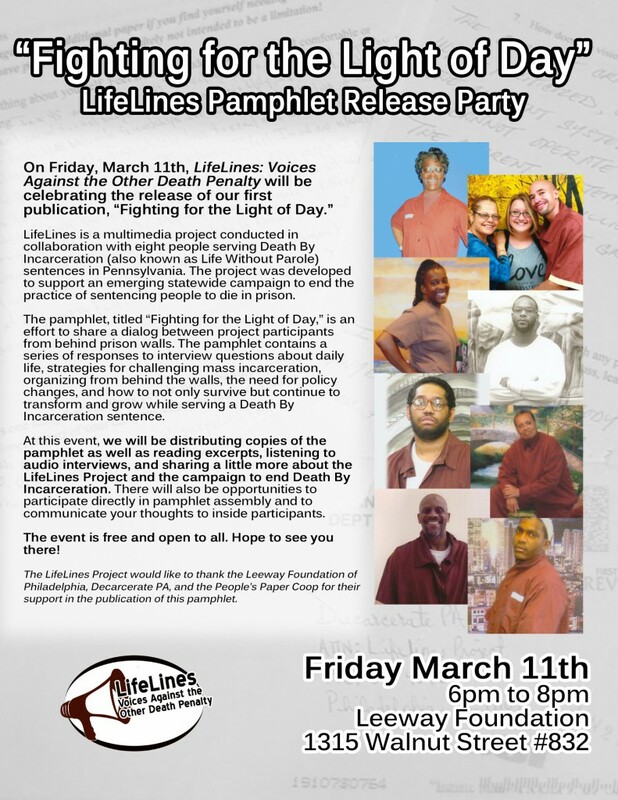 On Friday, March 11th, LifeLines: Voices Against the Other Death Penalty celebrated the release of our first publication, Fighting for the Light of Day. LifeLines is a multimedia project conducted in collaboration with eight people serving Death By Incarceration (also known as Life Without Parole) sentences in Pennsylvania. The project was developed to support an emerging statewide campaign to end the practice of sentencing people to die in prison. We use the term “LifeLines” to refer to the fact that this project highlights the stories and analysis of those serving life/death sentences and to point toward the many collective relationships and infrastructures of support that are forged in resistance to mass imprisonment. The pamphlet, titled Fighting for the Light of Day, is an effort to generate and share a dialog between participants in the project from behind prison walls. The pamphlet contains a series of responses to interview questions about daily life, strategies for challenging mass incarceration, organizing from behind the walls, the need for policy changes, and how to not only survive but continue to transform and grow while serving a Death By Incarceration sentence. Both the questions and the answers were generated by people serving Death By Incarceration sentences in Pennsylvania. At this event, we distributed copies of the pamphlet as well as read excerpts, listened to audio interviews, and shared a little more about the LifeLines Project and the campaign to end Death By Incarceration. The LifeLines Project would like to thank the Leeway Foundation of Philadelphia and the People’s Paper Coop for their support in the publication of this pamphlet. And special thanks to the eight people whose voices are featured, for being part of this project and for their tireless work for justice and freedom.